In 1 Kings, chapter 19, the Bible says that the prophet Elijah, overwhelmed by the challenges he faces, asks God to let him die so he can escape his circumstances. He then falls asleep under a tree. 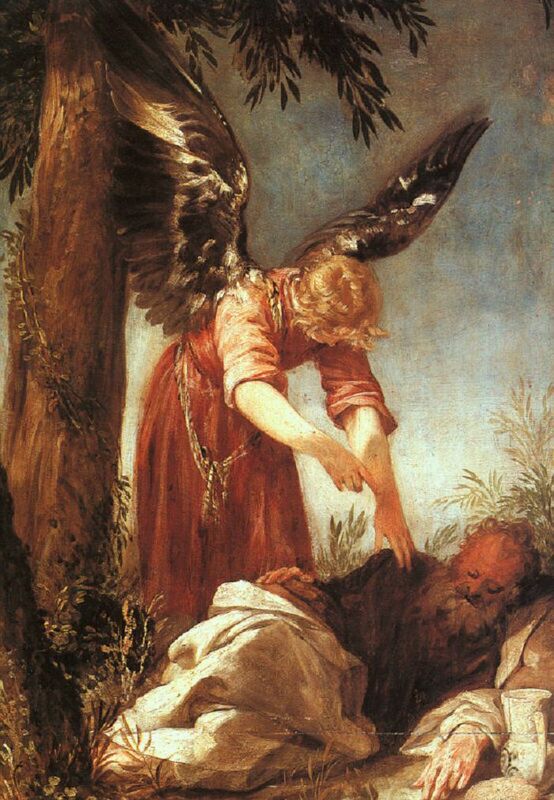 The Angel of the Lord--God himself, appearing in angelic form--wakes Elijah up to comfort and encourage him. “Get up and eat,” the angel says, and Elijah sees that God has provided the food and water he needs to recharge. Queen Jezebel had been using her army to ensure that people worshiped the deity, Ba'al. After Elijah--with God's miraculous intervention--defeated 450 of her men, she sent a message saying she would have him killed within 24 hours. “[…] He came to a broom tree, sat down under it and prayed that he might die. ‘I have had enough, Lord,’ he said. ‘Take my life…’. Then he lay down under the tree and fell asleep.” (verses 4-5). God answers Elijah’s prayer by showing up personally, as the Angel of the Lord. The Bible’s Old Testament describes many of these divine angelic appearances, and Christians believe that the Angel of the Lord is Jesus Christ, interacting with humans before his incarnation later, on the first Christmas. Just like a parent taking care of a beloved child, the Angel of the Lord makes sure that Elijah has everything he needs. The angel follows up a second time when Elijah doesn't eat or drink enough the first time. As any good parent would point out to his or her children, it's important to address hunger and thirst, because those needs should be fulfilled in order to be strong enough to handle stress. When Elijah's physical needs are met, God knows Elijah will also be more at peace emotionally, and better able to trust Him spiritually. The supernatural way that God provides food and water for Elijah is similar to how God performs miracles to provide manna and quail for the Hebrews in the desert and to cause water to flow from a rock when they were thirsty. The story ends by describing how the nourishment gave Elijah remarkable strength--enough for him to complete a journey to Mount Horeb--the next place God wanted him to go. Though the journey took “40 days and 40 nights” (verse 8), Elijah was able to travel there because of the Angel of the Lord’s encouragement and care.